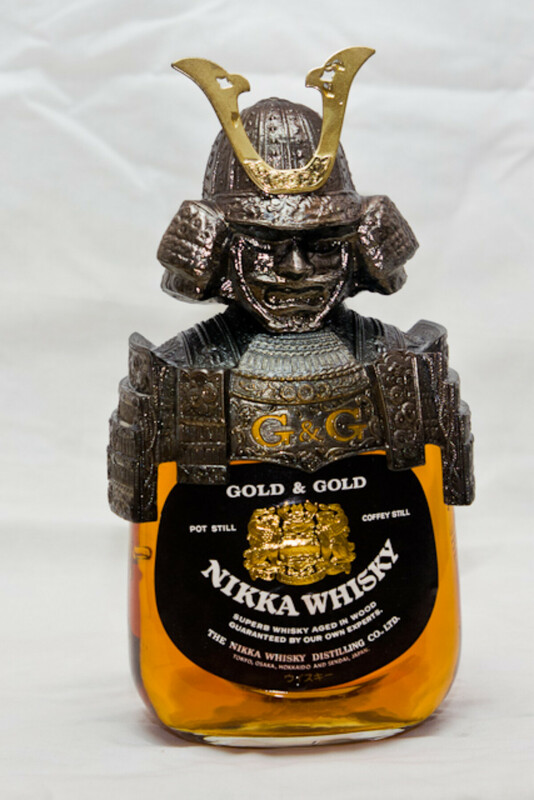 I've had this bottle of Samurai Whiskey since 1997 when I made my first trip to Japan. I picked it up in the Osaka duty free on my way back to Korea. It's been sitting on a shelf ever since unopened. I just realized that a bottle like this is unlikely to survive shipping across the ocean when I move back to Canada this summer. So later this evening I'm going to open the bottle and have myself a shot. This is also my first attempt at product photography. I don't have anything resembling a proper set up. All I did was drap a reversed curtain (so the white side was up) over a small table and set it up so part of the curtain was vertical to act as a backdrop. I then turned on all the lights and used my speedlight 430 EX II - took about 25 shots with different settings on the speedlight before choosing this shot. Yes I know the backdrop has wrinkles, these curtains have been folded up for months in a closet and I couldn't be bothered to iron them.